About 5 years ago the Hottest Stocks to own were SIRI and XMSR. SIRI which was formally around $5 / share was said to make it to $20 a share. The daily volume traded on these stocks was ridiculous. The investors who bought these stocks could be broken down into two groups. The noobies who put everything into SIRI because they believed Cramer, and the other TV investors. Then there were those who knew that the business model was doomed for failure, and just wanted to make some quick money off those who were too dumb to see the light. Satalite Radio is a great idea. Listen to Music or Talk Radio from anywhere in the USA. However due to the way Satalite radio works there would never be a Web 2.0 version of Satalite Radio. Meaning A person's car could never talk back with the satalites. The communication goes 1 way only. For years I have listened to Internet Radio on my home PC. Then within the last 2 years I started to listen to it via my Cell phone's data connection. The next step of course was to put internet in your car which is exactly what BMW has done. 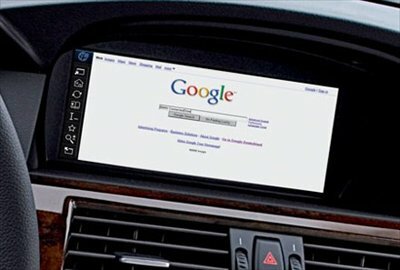 BMW's new connecteddrive system allows you to surf the web while you drive. Or at least while moving under 3MPH. The system allows you to put your cell phone's GSM SIM card into the dash. Giving your car access to your mobile provider's Edge Data Connection. Even though this is nothing fast ( slightly faster than dial up ), it does give you access to the internet. The sysetm will only be available within Europe initially. No word on when it will make stateside. Those of you who own SIRI or XMSR stock now would be a good time to sell. Internet in the car means you will get your music, navigation and everything else via the internet. Technology sure is advancing nicely. 5 years ago if you wanted an in dash DVD / TV system you would have to spend $2k. now if you can get a system off ebay for under $200. Give it 5 years and we will be able to buy indash PC's like this that can take a Sim car for a few hundred dollars. I can't wait! Email Needed to confirm comment, but not made public.